London, OH - From fmcpt.com, "The [.3-mile] Ohio to Erie Trail extension between Maple & Walnut Street in London will soon be completed with a limestone finish by the end of the year. We plan to put asphalt down in the spring. "However, only 68% of the original estimated cost has been raised to date. We still need approximately $25,000 to complete the paving. If you can donate to help, that would be greatly appreciated! Just click HERE for more information." Groundbreaking took place earlier this month for trail construction that will close about .3-miles of this gap. The construction will extend the trail on the eastside of London -- the Roberts Pass Trail -- west to S. Walnut Street. When construction has been completed, a .9-mile gap will remain between trail sections. Plans are moving forward to close the 1-mile gap between the Prairie Grass and Roberts Pass Trails in London, OH. An agreement has been reached with a property owner to purchase a 5-acre parcel of land which would allow the trail connection to be made. To pay for the land, Madison Soil and Water Conservation District is applying for a Clean Ohio Trail Grant through ODNR. If approved, the grant could cover up to 75% of the $131,800 property cost. From madison-press.com, "Yellow caution tape crosses the Prairie Grass bike path at Roberts Road as a warning. The path has been undergoing a crack fill and seal coat process for several day, which was delayed due to bad weather. It will re-open by middle of next week." 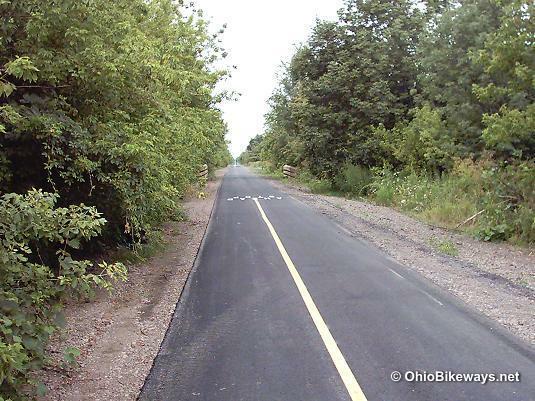 From fmcpt.com, "Ohio to Erie Trail users: please note that sections of the Prairie Grass Trail in Madison County will be closed during August 15-17 for seal-coating the asphalt. "If you choose to ride this section west of London during this time period, you may have to detour around the closed sections by taking a connecting road to U.S. 42 and bypass the closed sections. This will give you a change in scenery but still allow you to get to your destination. A different seal-coating project is planned for the Madison County Senior Citizen Center parking lot during August 18-21. This means the Prairie Grass Trailhead may not be able to be accessed via motor vehicles during this time period. "However, if your plans include driving to London to get on the trail, please consider the Roberts Pass Trailhead parking lot off Center Street on the east side of London. Or, there are various business parking lots along the Business Street Route across London." Brush is being cleared from an area near the shelterhouse at the Prairie Grass Trailhead in London, OH. The clearing is to establish 2 campsites for traveling cyclists along the Ohio-to-Erie Trail as they pass through London. Facilities: In / near the towns along the route. Worth Noting: Expect plenty of sun exposure on sunny days. The Prairie Grass now refers to a 30-mile bikeway that extends from Xenia eastward to London, Ohio. After a short gap in the trail, a 6.6-mile section dubbed Roberts Pass carries on toward Columbus, OH. The Prairie Grass Trail is one of 5 trail sections that converge in Xenia, Ohio at the Xenia Station. 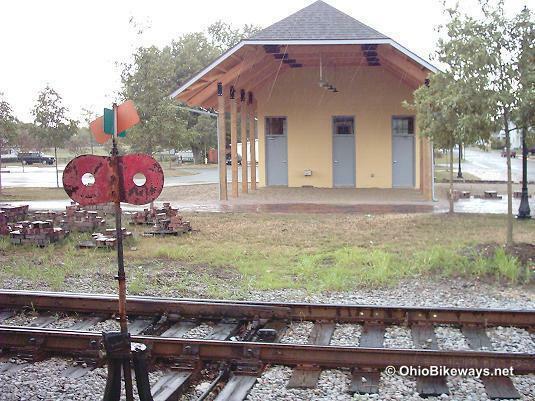 To learn more about this unique trail junction, visit the Xenia Station page. 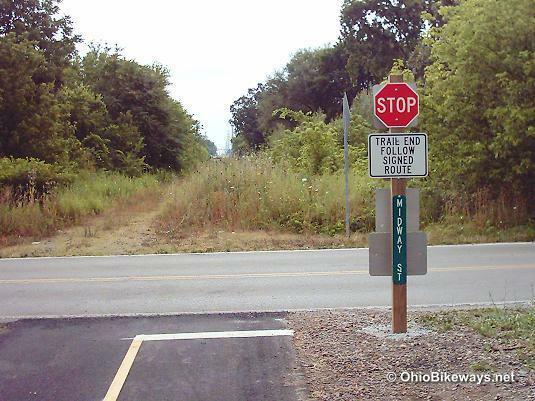 This trail, along with the Little Miami Scenic Trail (which also connects to Xenia station), combine for 89-miles of the Ohio-to-Erie Trail route in SW OH. The Cedarville section is a rural trail that was paved in 1998. There are a couple of dips and small undulations along this bikeway -- hardly enough to be called hills, but a bit of a departure from ultra flat rail-trails. There are also two wooden viewing platforms that overlook a small ravine on either side of the trail. As you approach the heart of Xenia, a Xenia Station sign lets you know you are nearing the largest intersection of paved bikeways in the state of Ohio. The trail comes to an end at Hill and Detroit Streets (Rt. 68) in Xenia. From here a widened sidewalk guides you through 2 crosswalks before you reach trail again on the edge of the Xenia Station grounds. Typically crossroads along the bikeway are marked with street signs. And where the trail encounters these crossroads, the path has been designed to be perpendicular by curving to meet roads at right angles. This increases safety at these junctions by giving cyclists a better view of oncoming traffic. It also adds small curves to the pathway, giving the trail more character. Where the trail currently ends at Midway Street in London, a signed bike route leads riders to the next section of completed trail about 1.5 miles away. Plans are in the works to reduce this gap to Roberts Pass, on London's eastside. Update: 9/16/17 Groundbreaking took place earlier this month for trail construction that will close about .3-miles of this gap. The construction will extend the trail on the eastside of London -- the Roberts Pass Trail -- west to S. Walnut Street. When construction has been completed, a .9-mile gap will remain in the trail.